The 2019 Ohio Minimum Wage Poster is a minimum wage law poster by the Ohio Department Of Commerce. This is a mandatory posting for all employers in Ohio, and businesses who fail to comply may be subject to fines or sanctions. This poster must be posted in a conspicuous place where all employees will see it. This poster describes what the minimum wage is for tipped and untipped employees, as well as how overtime is calculated, what records employers have to keep, the rate for those who are handicapped and who is exempt from the minimum wage. It appears you don't have a PDF plugin for this browser. 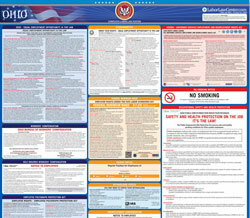 Please see the link below to download ohio-dico-2019minimumwageposter.pdf. than thirty dollars 	($30.00)	 per month in tips. “Employers” 	who gross less than $314,000 shall pay their employees no less than the current f	ederal minimum wage rate. “Employees” 	under the age of 16 shall be paid no less than the current federal minimum wage rate. “Current Federal Minimum Wage” 	is 	$7.25	 per hour. the minimum wage when direct or cash wages and the tip credit amount are combined. grossing less than $150,000 per year. the Director of the Ohio Department of Commerce. non	-profit organization or group of	 organizations. family members of an	 owner.